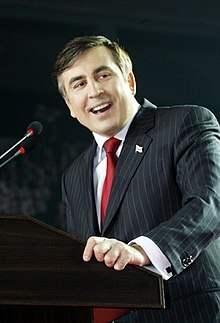 ^ a b c "East of Center » Blog Archive » Georgia: Saakashvili The Corruption Slayer". eastofcenter.tol.org. Archived from the original on 2012-06-09. ^ David Oakley (2 February 2007). "Sweet Georgia". Financial Times. Retrieved 5 September 2015. (Subscription required (help)). ^ Horowitz, Jason (2014-09-19). "Mikheil Saakashvili, Georgia's Ex-President, Plots Return From Williamsburg, Brooklyn". The New York Times. ISSN 0362-4331. Retrieved 2019-04-06.